Cuisinart have combined their two best selling products to give you the new Cuisinart GRSM1WU 2-in-1 sandwich and waffle maker. Make delicious thick, deep filled toasted sandwiches in the Cuisinart 2 in 1 sandwich and waffle baker. The extra-large sandwich plates feature deep pockets to allow for plenty of sandwich filling. Try making quick and easy omelettes, calzones, quesadillas, and even pastries with the sandwich maker plates. 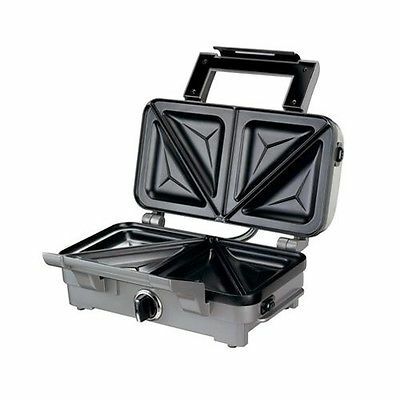 Both the toastie and waffle plates are removable, non-stick and dishwasher safe, making it easier to clean after use. Robust and durable commercial grade brushed stainless steel housing.